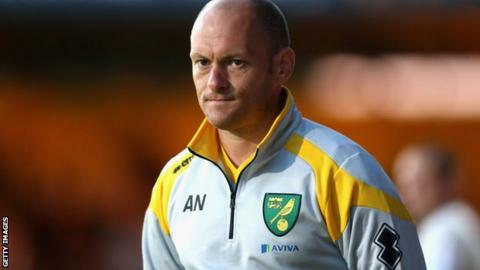 Norwich City manager Alex Neil says he's used to being written off from his time in charge of Hamilton Academical. The 34-year-old clinched promotion for the Canaries in May but could face a stiff challenge to keep them in the Premier League. "Something like eight out of eight had us finishing last and we were third at Christmas," he said of media guides ahead of Accies' top-flight return. "It's a good challenge for us to prove people wrong." Neil moved south in January having steered Accies, as player-manager, from the Scottish Championship to the upper echelons of the top flight, and thinks the experience was "key" to his success in England. "It was a great grounding for me in terms of getting into the coaching and management side, dealing with players, dealing with situations," he said. "The pathway for me to come to a club like Norwich has been perfect, because it's a family-based club. That progression was the perfect one for me." The English game was once a haven for Scottish managers - as recently as 2011, seven Premier League clubs had Scots at the helm. Now, Neil is the nation's sole representation south of Hadrian's Wall. "I don't think too much about it," he said. "People from Scotland will be happy there's sill somebody representing the country. "It wasn't long ago that we had maybe five or six, but I think things happen in cycles. "There's been a spell now - there's a lot of young managers coming through in Scotland as well as England. Hopefully that's a cycle that will continue and give more young guys an opportunity. "Four years ago, I wasn't even thinking about going into management. I've got my own methods in terms of how I think the game should be played and what I try and do with players and thankfully up until now it's worked." Norwich open their Premier League account against Crystal Palace at Carrow Road on Saturday.